With it’s large screen and shiny reflexive case the iPhone is a price target for scratches and scrapes. Basically a case becomes a must have item. At first I went searching for a traditional belt clip slide in case but that would still leave the iPhone exposed when in use, and with it’s size it wouldn’t be comfortable on a belt anyway. Lots of browsing on Apple’s site led me to a few choices, but I wanted to see the cases myself in person so I headed to a local Rogers store. When confronted with a large selection I decided on something that would cover the iPhone completely, meaning a screen shield and a case. Ultimately I decided on the Griffin FlexGrip case. 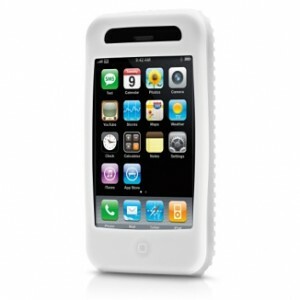 Since I had the white 16 GB iPhone a white case seemed like the way to g, but it’s available in quite a few colours. I chose this case or three reasons: For $20 CDN it came with a screen shield and was textured to eliminate slipping either in my hand or on a surface. The screen shield is covered front and back in a film of plastic: remove the one side, apply it to the screen and remove the other side. Simple in theory but lots of adjusting to get it just right. The textured silicone is one piece and you stretch it over the iPhone to get it in place. It’s a good feel and gets the job done. I find the sides bow out a bit but it’s certainly not a deal breaker. Easy, cheap and cheerful: what’s not to like about the Griffin FlexGrip.